The Turtle has been a powerful spiritual symbol in a number of traditions and cultures worldwide. From the Native Americans to the Japanese, there are countless creation legends that feature the Turtle as a pivotal character. In some Native American tales, the Turtle is the deity of the world's shores. Tradition has it that the animal brought mud from the bottom of the vast global ocean and used it to form the continents. This association with Mother Earth and the Ocean, may account for why turtles represent the feminine cycle and the motions of the Moon. Of course, one of the most famous associations of the Turtle comes from the timeless childhood favourites known as Aesop's fables. In The Tortoise and the Hare, the Tortoise is viewed as a wise animal and the power of 'Brains over Braun' comes into full focus. This concept is not an isolated one; in fact, many African and ancient Greek traditions are filled with stories praising the wisdom of the Patient Tortoise. On average, tortoises live to the spritely old age of 150, as such, they are revered as symbols of health and longevity. The Zuni tribes of New Mexico craft medicine bags that are emblazed with the emblem of a turtle. These special bags are said to boost health and help the wearer defy death. The Navajo carry out a similar practice; the only acceptable vessel for the administration of medicine is a turtle's shell. In Jamaica and other parts of the Caribbean, sea turtles are viewed as potent aphrodisiacs. Although the practice is illegal due to the extremely low number of turtles left in the wild, many men hunt and eat these precious animals in the hopes of boosting their performance and sexual prowess. Whether you hold The Turtle as a spiritual entity of creation or a beautiful extension of Mother Nature, their charm and influence on the conscience and soul of humanity is undeniable. Polynesian, Samoan, Hawaiian, and Maori design elements are the most prominent features in tribal turtle tattoos, largely because these creatures are intricately intertwined with cultural identity of these islanders. As people and ideas spread across the globe, mainstream tattoo artists picked up on the ancient traditions of these noble people and tribal turtle tattoos carry with them the cultural tapestry of the islanders and their deep spiritual connection to the Sea, Mother Nature, and the Turtle. A deep rooted reverence for turtles isn't a concept solely for Pacific islanders. The Turtle is an emblem of Mother Nature, so it isn't uncommon for persons to combine their cultural roots with this spirit of Earth and Water. Traditional Celtic knots are infinite loops representing the unending cycle of life and longevity. When fused with the image of the Tortoise, these celtic turtle tattoos are a great way to blend two seemingly unrelated cultures and express your desire for a healthy, long life. This popular slogan of the 1960s is now one of the cornerstones of many social activists and environmentalist groups. As a divine creator, the Turtle has always represented the beauty and intricate complexity of Mother Nature. A Peace Turtle Tattoo is a great way to pay homage to both the ideals of 'One Love and Peace for All' and humanity's awareness of its impact on the world's ecology. Raphael or Michelangelo; which Teenage Mutant Ninja Turtle was your favourite? Cartoon Turtles exploded onto the scene in the 1980s with the rise of these pizza loving, tail-kicking ninja turtles and today, countless spawns and spin-offs have been generated. 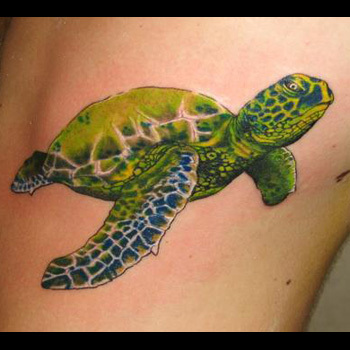 Most cartoon turtle tattoos pay homage to the turtles that started it all, but there are still many more Cartoon Turtle Tattoos that embrace the essence of childhood Innocence and Frivolity. Fusing your tattoo with the right design elements can make or break your artwork. When creating the perfect tattoo masterpiece, it's best to think about what each element of the design symbolizes and where it'll be placed on your body. Does it match your personality and style? If you need inspiration, then visit our design page at www.itattoodesigns.com and take advantage of our Custom Design Service. Our team can design a truly unique piece for you.